Our Academic glove boxes are high specification "state of the art" systems that are designed for professional use in an advanced economy. In simple terms our Academic range of glove boxes are designed with PRODUCTIVITY ENHANCEMENT in mind. Your time is a commodity that is consumed in operating the glove box control systems and facilities, and any improvement that minimises that time will allow more opportunity to focus on your core activity. During an average day, a glove box user will save 10 minutes in every hour using an advanced system design versus a basic manual glove box designed under the lowest price criteria. That amounts to 1 hour 20 minutes in an 8 hour working day or 2 working months in a year. The cost of that unproductive use of labour in one year, far exceeds the added expenditure of a PRODUCTIVITY ENHANCED system compared to a basic system. And after the first year of operation it is all gain. In other words the added cost of a higher specification glove box has a payback within one year. But there is more. Operational efficiency is matched by the efficiency of glove box performance. How ? By making glove box functionality a priority, ensuring quality components are utilised and the superior design capabilities take precedence over the purchase price. The Academic glove box is specifically adaptable to facilities that need to be installed in the floor of a glove box. This is due to the gas purifier position being on the end wall of the glove box. 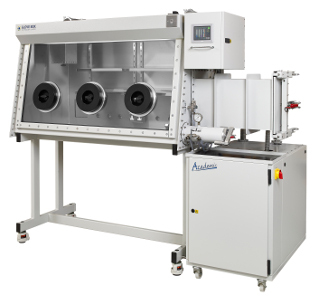 This feature makes it a very adaptable glove box system particularly suited to academic institutions engaged in research and development.